Seems overwhelming but pretty simple. Also, for the hebrew word; I'm looking for the transliteration of it. Near the water, but on land. Has an island, but not on that. A city of six, and four things surrounding that. Canada is a friendly place! OK! Blue Jays! Let's! Play! Ball! But dinosaurs roam the land. Welcome to Jurassic Park! We the North! I downloaded the linked file and converted it to a jpeg like the mime type suggests and got this image. From here, there is several things to work with. The first thing that stuck out was the non-english word. The language looked familiar but I couldn't initially place it. After a quick search I found that it is hebrew. So, with the help of google translate, we find that the word is God. Next the five number code and Georgia. This immediately appears to be a zip code and looking it up it's the zip code for Enigma, Georgia. This probably is referencing an Enigma Machine. 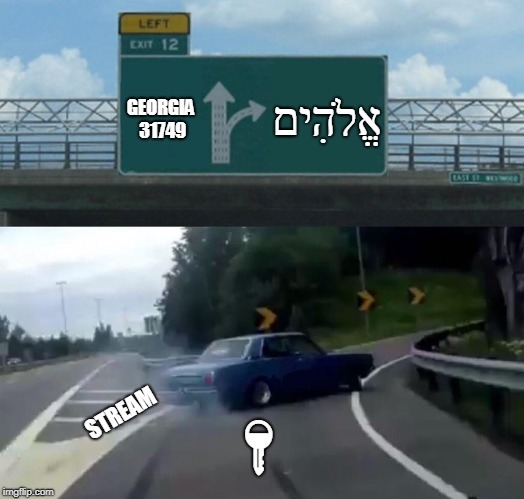 Finally, we have the word stream and a picture of a key. This reminds me of a Stream Cipher, which uses some cryptographic key. Furthermore, I believe the Enigma Machine uses a type of Stream Cipher. Since the car is going away from Enigma and towards god, I figure that god is probably the key and the base64 text in the question is the cipher text. But this is where I am stuck. I don't know what stream cipher to use. I tried RC4 with the key as god, God, and GOD, but no such luck. Not the answer you're looking for? Browse other questions tagged riddle knowledge computer-puzzle geography cryptography or ask your own question. Oh no! A hacker has taken control of my computer!